This is what we have been waiting for; a weekend of easterlies is on the way. The easterly flow currently covers the whole of the North Island and top of the South Island and could last until Monday or Tuesday. The lower South Island should have light southeasterly winds tending more to the east as the weekend progresses. This is the time of year that some very big snapper are taken on the west coast. 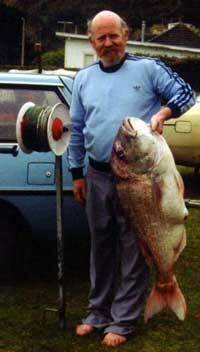 The biggest snapper ever taken on a kite, that we are aware of, was caught at Port Waikato in the winter of 1993. So if you have not been out kitefishing this winter (and we don't blame you, it has rained on 51 of the last 60 days) now is the time to get back into it. Well the week started off great with a 24.5lb (11.12kg) snapper landed on Friday 19th July on a Kontiki Longline baited with kahawai. 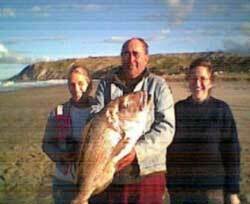 The magnificent fish was caught by Mr. & Mrs. McGregor and their daughter, from Norswood. After landing the snapper the mainline broke leaving the Kontiki towing out most of the mainline. The alarm was raised and the Sciascias came to the rescue. Nick called up his fishing vessel by VHF and they raced over and picked up the Kontiki and mainline. Word of the awesome catch on Friday spread quickly and by Saturday there were many kontikis, surfcasters, and kite fishers out chasing big snapper. However, it was not to be, and only red cod and kahawai were caught. Sunday saw another good turnout on the beach but again only red cod and kahawai were landed. The sea was perfectly calm on Monday so Scotty and crew took his new 6.2m Senator out and caught twenty tarakihi and were back at the beach within two hours. Don't forget to bring your catch along and get it weighed in. The kahawai contest closes on the 28th October. If you have time you can watch Paul's Kitefishing video, have a cup of coffee and check out our range of Paul's Fishing Kites products. Stu McNamara went kitefishing this week at Uretiti and did not encounter any weed. Fishing 300 metres to the right of the end of Tip Road, Stu put out three sets to around 800 metres and all came back clean. He caught one kahawai and one snapper, which weighed a healthy 4 lb. Stu was using a Bottom Longline Rig and would have picked up any weed if it was still off the beach. Stu is not sure if he was in a clear spot on the beach or whether the weed has finally left the beach. Any reports about the presence of weed in this area would be appreciated. My partner Mark went out on the inner Manukau Harbour on Saturday and Sunday and brought home fifteen gurnard, with a couple between one and two kilos. He used mullet and pipis for bait. Mark also managed to catch a barracoutta, which was a surprise, particularly as he was fishing inside Puponga Point. The Manukau scallops are in very poor condition at the moment and probably won't be worth targeting for at least another month or two. Dave Billings from the Kitefishing Club was out at Glinks Gully this week. With only a very light northeasterly breeze on the day, Dave had to use his Mega Mouth Kite to have any chance of getting his Bottom Longline Rig out. He put out two sets and caught one kahawai and two gurnard. With a big swell generating high surf and strong rips and with only very light winds to operate in conditions were challenging to say the least. Well done on catching fish despite everything being against him! David's friend Rick had a better day at the top end of Muriwai a couple of weeks ago. Rick put out three sets with his Dropper Rig and caught 30 fish over the day. He caught fifteen kahawai, seven gurnard and eight snapper. The best snapper weighed in at 3.5 kgs. If you have any photos of these fish Rick, we would like to have a copy to post in our next newsletter. Paul's Fishing Kites are putting together a comprehensive Map Guide covering kite and kontiki hotspots around New Zealand. We are using the Tumonz NZ mapping program and will display all the popular kite fishing beaches in great detail on our website. The Tumonz program can produce maps of any area in N.Z. at any scale. This is a huge project that will take at least several months to complete and we will need your help to make it work. If you want to assist please Contact Us and we will send you a map of your area with grid co-ordinates which you can use to identify features of interest to kite and kontiki fishers. If you know of a snag or other localised problem kitefishers should know about on any of the maps currently on site or have information for a beach we do not yet have on site please let us know. The map project will only be as good as the info you send in for it. We are mainly after important local information for the maps such as snags, seasonal weed, drifting logs or rubbish in floods, shark seasons or best months for snapper, best baits etc. As soon as you send the information back to us we will enter it onto the map and post it on the website. We have kept it simple as possible. It is very easy to add information about any area and should only take contributors a few minutes to fill in the form. We want to make the maps freely available but this can only happen if we get a good response from contributors. We will be providing you with information for each beach, such as which rig is the most suitable for the area, what you would expect to catch at different times of the year etc. If enough people get in behind this project Paul's Fishing Kites will make information from their vast database available for the mapping project. Please have a look and tell us what you think of it. We are receiving so many catch reports that we have designed a database to collect and collate the information received. To ensure the data is received in a useable format we have posted a new easy to use Beach Fishing Report Form online. You can now fill out a report in a couple of minutes or less! The new Fishing Report form is great for those who dislike typing a full report. The database that the new catch report forms will generate will provide the most valuable source of area specific fishing information available anywhere. If enough people use these forms we will be able to let you know detailed information such as how many snapper does the average kitefisher catch per 25 hooks set at Muriwai, or anywhere else. We are sure everybody would be interested to find out how many gurnard, kahawai, sharks, trevally or kingfish are caught per 100 hooks set off Kariotahi. All this and much more can be available and be extremely accurate if we have 500 to 1000 contributors sending in catch reports. If we have over 1000 regular contributors the information could be used to help determine overall trends in the fishery over time i.e. is the stock size or the average size of fish increasing or decreasing? Other information, such as which is the most efficient rig for the west coast or the east coast, the best kites or baits in any area and much more, will be easy to access from the database. We have tried to include in the Fishing Report Form all the important categories to gather useful information you can use when planning to go kitefishing. If you have any ideas or suggestions for new categories please advise us so we can add this to the drop down select lists. If you want to send us a more detailed fishing report about your fishing trip this can also be done using the same catch report form, which has a text area for you to use. While you are there please fill out a form for your last trip and any other trips you can remember. Don't forget we need every trip reported, not just your most successful days out. All your information is useful and makes the database more accurate. It is very important that we receive catch reports for unsuccessful days as well as those where fish were caught. We envisage we will need at least 200 Fishing Reports to make any useful conclusions and will post the first results online once we reach this level. Barry and Sonya Adams were kitefishing near Mokau on Tuesday July 16th with a 65kg Dropper Rig powered by a Power Chute Kite. They successfully deployed the rig and used bonito for bait. It is unknown how many sets they put out but they caught three sharks, one gurnard and a very nice snapper which weighed in at 25lb. An excellent day's fishing for them. Roger (unknown surname) has been into the shop this week. He has been fishing north of the Kaipara using his 65kg Dropper Rig. Fishing at low tide, Roger had to tack his kite 45 degrees to compensate for the northeasterly wind which was a mere six knots. Roger put out two sets of ten hooks and caught three kahawai and four gurnard.